The island of Thera (now known as Santorini) was once home the Minoan Bronze Age civilization known as Akrotiri. Around 1627 BCE the island was destroyed by one of the largest known volcanic eruptions ever. On the nearby island of Crete the Minoan society was at its height. It was one of the most advanced and powerful civilizations in the Mediterranean world, and the destruction of Thera is considered the most likely source for the legend of Atlantis. Akrotiri was excavated in 1967, and like Pompeii, the volcanic ash left the artifacts extremely well-preserved. 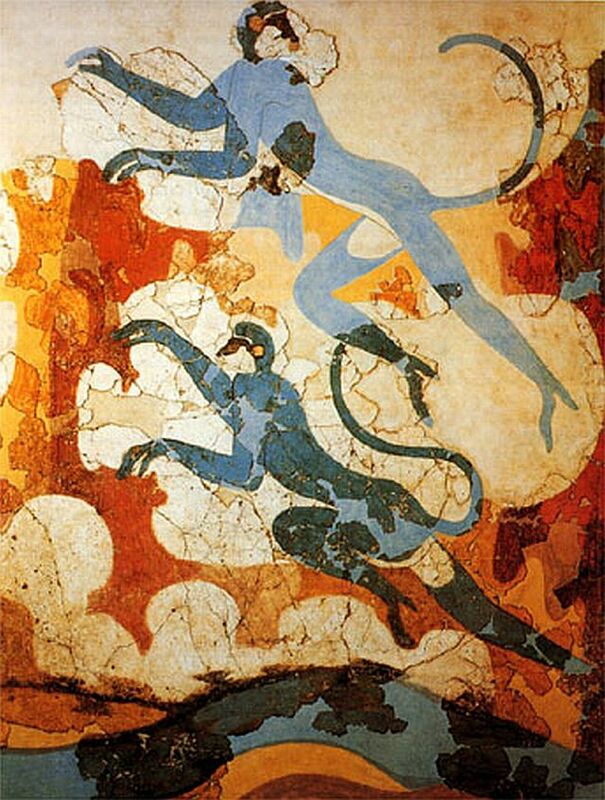 The series of frescoes I have shown here are perhaps the most beautiful (surviving) painting of the Ancient Aegean civilizations. The artists demonstrate highly developed use of color and space and their delicate designs are remarkable. Furthermore, they are also an invaluable window into the history and culture of the Minoan settlement on Thera. In this series of frescoes we see (from top to bottom) a river landscape with plants and animals, a Minoan town, a woman who is most likely a priestess, a pair of boys boxing, the famous blue monkeys, and spring lilies with sparrows. Involvement with plant and animal life is prevalent in these paintings. By studying these frescoes we can gain insight into Minoan civilization on ancient Thera, for each of the many beautiful pieces is rich with the aesthetics and values of its people.